Newell IA is a great place to call HOME! Newell is a small Iowa town, home to about 876 people and where no one is a stranger. 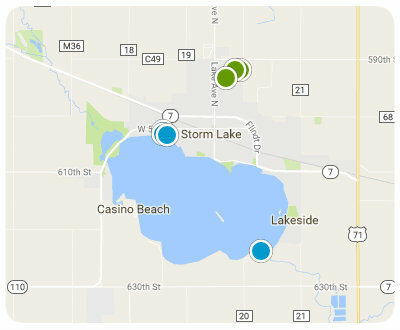 The town has a lot to offer a home buyer including, great homes at affordable prices, low taxes, a 9 hole golf course, a swimming pool, tennis court, 2 baseball diamonds a tree park, excellent schools, and close proximity to Storm Lake. Newell shares their school system with Fonda, the Newell-Fonda Mustangs. It has great schools and the graduation rate in 2016 was 95.4%! That says a lot about this communities commitment to their children and to education. The town also has a a preschool, 3 gyms and a day care center just 1 block from the school. Newell has a big Annual event - Newell Pride Days, but there are many more things to do and see in Newell including the Allee Mansion and Museum, the golf course, swimming pool, parks, and Sturchler Park for fishing, electric motor boats, swimming beach, hunting, and picnics. Call Weaver Realtors 712-291-0118 we show all properties listed for sale in the Newell area.